Ideas are the oxygen of growth in the zero carbon economy, and organisations need to be fed with these big, scalable, commercially-viable ideas to be able to address climate change. Climate-KIC – the European Union’s Knowledge and Innovation Community for climate innovation – has been doing this so successfully, that some in Australia and New Zealand are now keen to set up their own version. 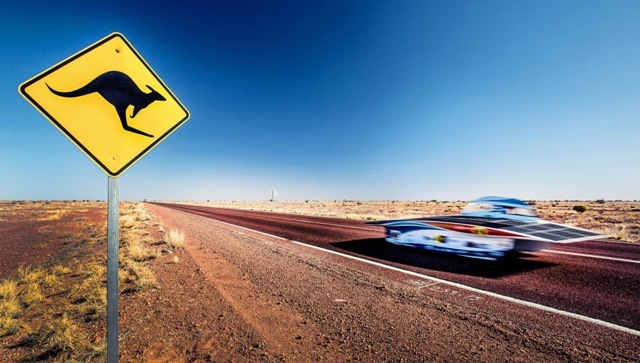 The Nuon Solar Team from Climate-KIC partner Delft University of Technology in the Netherlands recently won the World Solar Chalenge, a 3000 km race with solar-powered cars across Australia. At the COP21 climate change summit in December, the EU will be pushing for a binding deal that commits countries around the world to phase out fossil fuels and reduce carbon emissions. Leading up to the summit, some of the continent’s leading innovators are spreading the word around the world about the unprecedented opportunity to create a prosperous zero carbon future, driven by innovation, jobs, and investment. Climate-KIC’s international ambassador is one of them. Former CEO and professor emeritus Mary Ritter has already been visiting Australia for many years to visit family. “It has been concerning to see the climate change challenge increase in Australia, in a region that is particularly hard hit by rising temperatures and extreme weather events. But during my more recent visits it has been inspiring to witness a real cultural shift towards opportunity and positive action,” she said. Ritter is leading the development of a possible Climate-KIC ‘down under’ with businesses, universities and the government sector since late 2014. “We need to engage internationally, climate change is a global problem. A zero carbon economy can bring major benefits not only to Europe but to other parts of the world as well,” she says. Following almost four years at the helm as CEO at Climate-KIC from 2010, Ritter was in Australia at the end of 2014 in her new capacity as international ambassador, to meet with Climate-KIC partner Suncorp. “The idea began to germinate that perhaps we should think about being ambitious in the Australasian region, start discussions about setting up an entity that’s similar to Climate-KIC in Europe.” Ritter can also draw on years of academic experience at Imperial College London, including as pro rector for international affairs. Climate-KIC’s secret ingredient is the right balance of business, research and innovation. It is this mix that enables Climate-KIC to generate transformative new innovations and business models. Its European network of universities, businesses and public bodies is the catalyst for bringing them into fruition, and Ritter has been working hard to bring together a similar group of partners in Australia and New Zealand. “I am working with an excellent core team to organise local partners for the new partnership. Last month, we brought together people from across all sectors in key locations such as Brisbane, Perth, Adelaide, Sydney and Melbourne,” she said. Ritter is being assisted by Greg Morrison, a recently-appointed professor in sustainable cities at Curtin University in Perth, who has previously worked with Climate-KIC in Europe. With Australia’s new Prime Minister, Malcom Turnbull, putting innovation and start-ups right at the centre of his government’s policy, “the time is ripe” for an entrepreneurial approach for finding solutions to key societal problems such as climate change with “co-benefits for the economy” says Ritter, who says the first activities could kick-off as early as mid-2016. “The last time I was there everyone had a real smile on their face and they were really excited about being able to do something – to innovate. I think the momentum leading up to the global climate change summit COP21, and onwards into 2016 is something very strong,” stressed Ritter. One of the first Climate-KIC programmes that could be launched in Australia is the Climate-KIC Accelerator, which helps start-ups to bring their disruptive clean-tech ideas to market faster through coaching, mentoring and funding, and exposure to big business partners. In Europe, the programme is the largest accelerator of its kind with centres in major cities such as Berlin, London and Paris. The programme is hugely successful in Europe. Last year alone, 64 start-ups with ideas to tackle climate change collectively raised over €68 million (AUS$ 104 million) through external funding. Hundreds of start-ups are currently enrolled in the programme. A recent success is Nerdalize, a Dutch start-up company that was awarded the title of Europe’s best climate venture last month. The start-up, which heats buildings with computing power, has teamed up with major utility company Eneco in the Netherlands to conduct field tests. The Nerdalize concept puts servers in consumers’ homes to be used as radiators, and connects them through the internet, creating a huge decentralised data centre. Companies and institutions that require a lot of processing power can reduce their costs in the area of accommodation and cooling of datacentres up to 55 per cent with the concept developed by Nerdalize. Back in 2013, Climate-KIC already supported — and still works with — French start-up Qarnot Computing, the pioneer of this emerging, fast-growing field. This is a great example of how Climate-KIC works with market leaders, while also supporting new players and helping them develop the concept further towards new sectors. It is this kind of clean-tech success, coupling environmental benefits with economic advantages, that Ritter hopes the new partnership can help deliver in Australia and New Zealand. Another Climate-KIC initiative that could soon be deployed down under is The Journey summer school. The course brings together students from across disciplines and gives them a crash ‘learning by doing’ course in entrepreneurship, following an introduction to the science of climate change. In just five weeks, while journeying between several top-level universities, businesses and public bodies such as city councils across Europe, students create real business ideas for start-ups – and many of these are now thriving. Students in Australia and New Zealand already participated in Climate-KIC’sClimathon earlier this year. During the global 24-hour event, teams around the world tried to hack a local city-focussed climate change challenge. In New Zealand’s capital, students developed an online solution to help reduce Wellington’s transport demands. The team was selected by a jury to present their solution at an event set to be hosted by Climate-KIC during the UN climate change summit in Paris next month. In Europe, Climate-KIC addresses climate change across four priority themes: urban areas, land use, production systems, decision metrics and finance. Education is at the heart of these themes to inspire and empower the next generation of climate leaders. Partners that are currently involved in the discussions led by Ritter are based in the Australian cities Sydney, Brisbane, Melbourne, Adelaide, Canberra, Perth – and Wellington, New Zealand’s capital. There would be ample opportunities for collaboration between the European and Australasian partnerships, says Ritter. Extreme events such as cyclones, flooding and bushfires could offer one area where the organisations could team up. Suncorp, one of Australia’s largest financial services companies, is already a partner in Climate-KIC’s Open Access Catastrophe Model (OASIS) project. OASIS creates computer models to predict financial losses as a result of catastrophes. Another area for collaboration could be the testing of new technologies in so called ‘living labs’, which Climate-KIC conducts through its Building Technologies Accelerator. Living labs are buildings to test technology prototypes in real-life environments. “If you wanted to test in tropical or subtropical situations, Australia would certainly offer that,” said Ritter. Efficiencies in the construction market have the potential to radically reduce carbon emissions. In Perth, the focus in on cities, but also on how they connect with their rural environment. “In Western Australia, communities are very isolated. So there’s interesting work to be done on micro grids,” says Ritter. “Also, innovation in the way land is used for agricultural purposes is very much on the agenda in several of the south eastern states” she said.